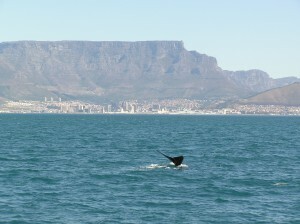 One of the highlights of visiting the South African Coast is going whale watching. The South African coast is actually one of the best places in the world to see these amazing mammals. The gentle giants can be viewed either by going out on an official licensed boat tour, or in places you can also see them from land as they come as close as 50 metres offshore! There are several places where you can do boat trips, even from Cape Town itself, with great views of Table Mountain as a bonus. Amongst the whales seen are Southern Right whales and Humpbacks on their annual visits, as well as Bryde’s whales and Minke whales. If you are lucky you can also see other marine life on boat trips like dolphins, orcas, penguins, seals and different types of birds. The Whale Route starts to the south of Cape Town and extends to Durban, allowing 1,200 plus miles of whale watching coastline. The route traverses several famous protected areas, including the Garden Route, Tsitsikamma National Park, and the Transkei. At least 37 species of whales and dolphins can be found in the waters off South Africa. From May through to November migrating whales can be seen off the coast, the sheltered bays and coves being a favoured place for mating and to rear young, whilst Bryde’s whales can be seen all year round. The Southern Right whales come from Antarctic feeding grounds to the South African coast to calve and nurse their young in the warmer waters over this time. 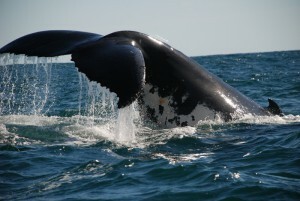 The Humpback whales, feeding on sardines, usually migrate along the coast during May to November between breeding and their feeding grounds in Angola and Mozambique. The Southern Right and Humpback whales especially can put on a great show of marine acrobatics as they frolic and play in the water.  Breaching – This seems to be great exercise or a form of communication. This behaviour creates a large splash involving leaping out of the ocean, to then fall back into the water – an act of sheer raw power.  Lobtailing – Another form of communication, a loud sound is created by the whale as it slaps its fluke or tail on the water.  Blowing – A whale’s regular breathing creates this sound as air is expelled through their blowhole. Condensed water vapour comes out at the same time.  Spy hopping – Lifting its head and body vertically, as far as the flippers, above the surface of the water, seeming to want to view all around it. It is possible to do whale watching trips to view these gentle giants on our Garden Route tour and the beginning of the Northern Trails tour, particularly from either the Victoria Waterfront in Cape Town or from Knysna. Clear windless conditions are best for whale spotting. « « Get Involved! Volunteer in Africa!